Martin L. (Marty) Demaine (born 1942) is an artist and mathematician, the Angelika and Barton Weller artist in residence at the Massachusetts Institute of Technology. Demaine attended Medford High School in Medford, Massachusetts. After studying glassblowing in England, he began his artistic career by blowing art glass in New Brunswick in the early 1970s. The Demaine Studio, located in Miramichi Bay and later at Opus Village in Mactaquac, was the first one-man glass studio in Canada, part of the international studio glass movement. Demaine's pieces from this period are represented in the permanent collections of half a dozen major museums including the Canadian Museum of Civilization and the National Gallery of Canada. Since joining MIT, Demaine has begun blowing glass again, as an instructor at the MIT Glass Lab; his newer work features innovative glassblowing techniques intended as a puzzle to his fellow glassblowers. 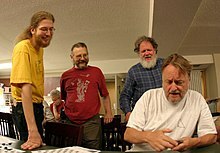 Martin Demaine is the father of MIT Computer Science professor and MacArthur Fellow Erik Demaine; in 1987 (when Erik was six) they together founded the Erik and Dad Puzzle Company which distributed puzzles throughout Canada. Erik was home-schooled by Martin, and although Martin never received any higher degree than his high school diploma, his home-schooling caused Erik to be awarded a B.S. at age 14 and a Ph.D. and MIT professorship at age 20, making him the youngest professor ever hired by MIT. The two Demaines continue to work closely together and have many joint works of both mathematics and art, including three pieces of mathematical origami in the permanent collection of the Museum of Modern Art, New York; their joint mathematical works focus primarily on the mathematics of folding and unfolding objects out of flat materials such as paper and on the computational complexity of games and puzzles. Martin and Erik are also featured in the movie Between the Folds, a documentary on modern origami. Demaine is a citizen of both Canada and the United States. ^ Author information in National Library of Australia catalog entry for A lifetime of puzzles : a collection of puzzles in honor of Martin Gardner's 90th birthday (A K Peters, 2008, ISBN 978-1-56881-245-8), edited by Demaine et al. ^ Martin Demaine appointed EECS Artist-in-Residence, MIT Department of Electrical Engineering and Computer Science, February 25, 2005 . ^ a b Barry, Ellen (February 17, 2002), "Road Scholar Finds Home at MIT", Boston Globe . ^ a b "Fluency", past exhibitions Archived 2011-07-14 at the Wayback Machine, Andrew and Laura McCain Art Gallery, Florenceville, New Brunswick, Canada, retrieved 2009-08-22. ^ Henkin, Stephen (October 2003), "In Touch with the Tides : Canadian Glassblower Jon Sawyer", The World and I, 18 . Jon Sawyer was an apprentice of Demaine at Mactaquac beginning in 1977. ^ a b Curriculum vitae from Demaine's web site. ^ Glass and glass-making in Canada - Inspirational glass. Canadian Museum of Civilization. Retrieved 2009-08-22. ^ The MIT Glass Lab: Martin Demaine. ^ a b Karafin, Amy (June 24, 2007), "'Puzzles Will Save The World.' Martin Demaine is kidding, mostly, when he says this, but his puzzles have made cars safer, candies easier to unwrap, and maybe one day will help cure diseases", Boston Globe . ^ Demaine, Erik (2009), "Algorithms Meet Art, Puzzles and Magic", Proc. Algorithms and Data Structures Symposium (WADS 2009), Banff, Canada, Lecture Notes in Computer Science, 5664, Springer-Verlag . ^ Erik Demaine, Homeschooling Teen Magazine, March 20, 2009 . ^ a b Wertheim, Margaret (February 15, 2005). "Origami as the Shape of Things to Come". New York Times. ^ Father and son share love of art, computer science, MIT Tech Talk, October 8, 2003. ^ Curved Origami Sculpture, from the web site of Erik Demaine. Retrieved 2009-08-22. This page was last edited on 19 January 2018, at 09:14 (UTC).